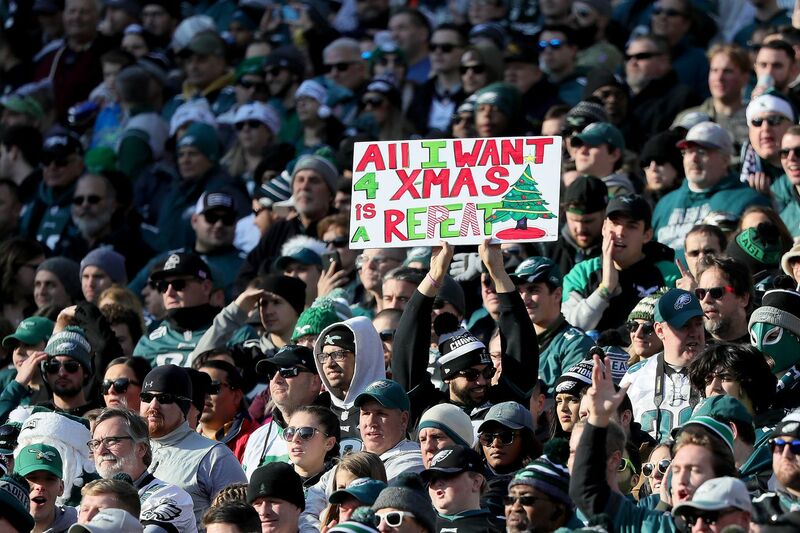 Will this fan's Christmas wish come true? The Eagles needed to beat the Texans if they wanted a chance to make the playoffs. They did it, but they didn’t make it easy. Philadelphia’s defense gave up a 13-point fourth-quarter lead to DeShaun Watson and the Texans. But thanks to Saint Nick Foles, who chartered the Eagles' offense down the field, and the leg of Jake Elliott, the Eagles scored a last-second field goal and won, 32-30. The Eagles still have to beat Washington next week -- and need a few other things go their way as well -- but Sunday’s win was a start. Let’s take a look at what fans were talking about before, during and after the game. Golden Tate and the Eagles were focused heading into the game. Early in the game, veteran Jason Peters was sidelined. Again. Jason Peters is in the medical tent. Fans noticed the offensive tackle’s absence, and weren’t always happy with Halapoulivaati Vaitai -- Peters' substitute -- and they voiced that opinion on social media. Speaking of older players ... Darren Sproles had a big day. Sproles, 35, has had a quiet return to the field after missing most of September and all of October and November. He made up for all of it with a few huge plays, including this 37-yard catch-and-run to score the first points of the game. Sproles finished with 32 yards on nine carries and three catches on six targets. Sproles has previously said he plans to retire after this season. What a way to go out. Then again, he was rumored to retire after last season. So will 2018 really be the end? Darren Sproles will still be playing in 2030, during the second term of Donald Trump Jr.’s presidency. Fans would prefer he stick around for as long as he can -- they’re still happy with the running back’s production when it matters. Sproles' touchdown was an important on-field contribution to Sunday’s win, but he didn’t stop there. He tossed the touchdown ball to none other than Eagle superfan and one of baseball’s biggest stars, Mike Trout. The Millville, N.J., native’s fandom for his hometown team is well-documented. It’s hardly surprising he’d make it to the Linc for one last home game. Trout will be hitting the free-agent market within the next few years, and Philly sports fans have long argued the Phillies would be a perfect destination for the 27-year-old star. Sunday’s interaction just fueled the fire. By accepting that TD ball from Sproles I think Trout is legally now on the Phillies. Sorry but that's how it works. It's the law. My colleague Yong Kim caught a great photo of Trout absolutely loving his good fortune at the Linc. Angels outfielder Mike Trout catches the football with which Darren Sproles scored his first-quarter touchdown. Sproles wasn’t the only Eagle to have a big day. Zach Ertz made history by becoming the all-time leader among tight ends for most catches in a single season. Two of those came as touchdown passes from Foles, including this one to give the Eagles the lead in the second quarter. Ertz finished with 110 yards on 12 receptions -- he passed former Cowboys tight end Jason Witten to become No. 1 on the list. It isn’t just Ertz’s hands that fans love. He demonstrated all of his skill-set on this fourth-quarter touchdown run that gave the Eagles a 29-16 lead. Is Ertz the best tight end in the league? This season, it’s hard to argue otherwise. Nelson Agholor got a piece of the action on Sunday, too. This epic 83-yard touchdown pass from from Foles was so on-the-money that Agholor was able to strut into the endzone for six points. He was so alone, he had to celebrate by himself. Still did a great job on that trust fall and somersault. It was around that moment late in the third quarter that the “Saint Nick” evangelists really got into it on Twitter. Of course, all game, people were finding reasons to talk about Foles. And Foles showed his worth at the very end, leading the Eagles' offense down the field to set Elliott up for a 35-yard field goal in the final seconds of the fourth quarter. Yes, Saint Nick did it again. But at the start of the drive, things didn’t seem so certain -- Foles went down with a big hit from Texans' linebacker Jadeveon Clowney, who was called for roughing the passer. Perhaps officials were making up for this missed face-mask call on Clowney earlier in the game -- a non-call Foles was not happy about. The hit left Foles on the ground and forced backup Nate Sudfeld to come in for a down. It had fans worried -- they could be heard chanting “Foles!” in the stadium -- but the Eagles' savior quarterback was fine, after all. His teammates could even laugh about it in the locker room after the game. I asked Alshon Jeffery what he was thinking when he saw Nick Foles down late in the fourth quarter. The nail-biting finish was the type of thing we’ve come to expect the past few weeks from these Eagles, who have won four of their last five. And the win made a lot of other teams happy, too. The Texans' loss meant the Patriots move back up to the No. 2 seed in the AFC, earning them a first-round bye. But the win didn’t help Vikings fans -- a loss would have made Minnesota’s road to the playoffs a bit easier. Now, it’ll all come down to Week 17. Eagles win on a 35 yarder. Vikings playoff hopes wait another week. They need to beat Chicago to get in or if they lose, they need the Eagles to lose or tie in Week 17. And Washington -- the Eagles' final regular-season opponent -- was eliminated by the Eagles after another loss yesterday. So, will everything fall into place for the Birds? Don’t worry, Eagles fans -- my colleague Jeff McLane has evidence Foles is fine, so you don’t have to worry about him. And he has enough confidence to rock these shoes (can they really be called shoes? ), which is impressive in itself. Can the defending Super Bowl champions make a run? Stay tuned.